It’s not like citizens of the GDR, the former communist part of Germany, were worldly, but they did receive their World Clock anyway. They were confined. Everyone in the GDR was equal, but the few who were more equal than most others flew to New York, New Delhi or Seoul. Those who stayed behind because they wanted their country so much that they had to be imprisoned in it, got to see the world anyway, on the new World Clock the regime ordered for the GDR’s 20th anniversary. Once that object was unveiled on September 30th, 1969, East Berliners knew what time it was in Tokyo, Rio de Janeiro and San Francisco. Why go there? Knowing what in the hell the time is over there was almost like being at Fisherman’s Wharf with flowers in your hair, taking a dip in the sea at the Copacabana or having Teriyaki sauce in Tokyo, right? Of course not. Giving an object like this one to the GDR citizens was cynical. 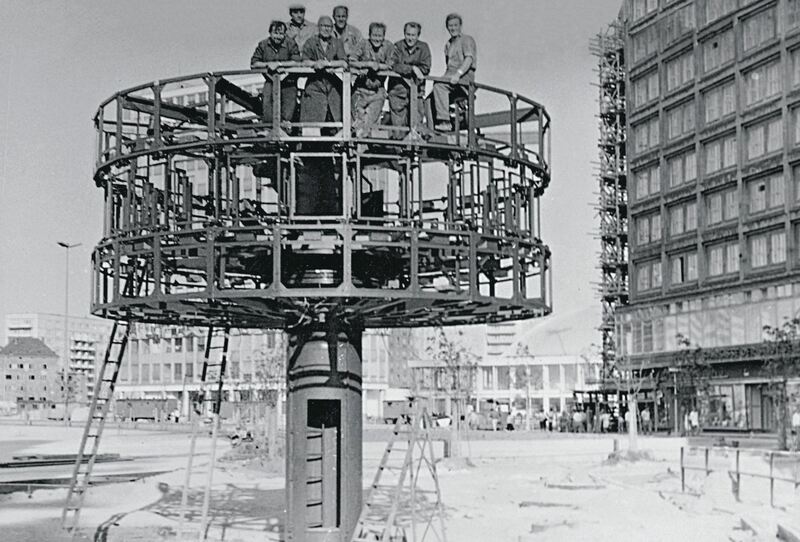 The construction quickly became one of the main sightseeing spots in East Berlin, and later in all of Berlin. It still is. Today, former inhabitants of the GDR do have the right to see the world symbolized by their World Clock, meaning the construction with its 1960s GDR design does not cause travel lust which can not be fulfilled. Not anymore. ‘Weltzeituhr‘ is the German word for world clock. 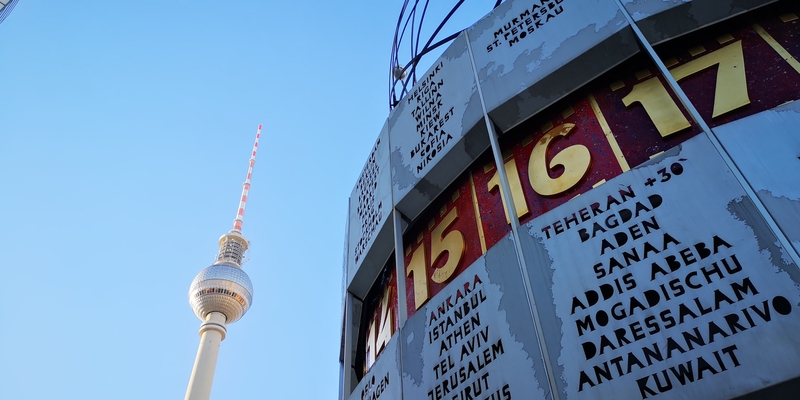 Nowadays, that word stands for the Berlin World Clock, in most cases, the object at Alexanderplatz. At its top, it has a rotating depiction of our solar system. Little metal spheres are the planets, metal bars are their orbits. Further down, the names of 146 cities in the world accurately rotate through the Earth’s 24 time zones. Each one has its own color. 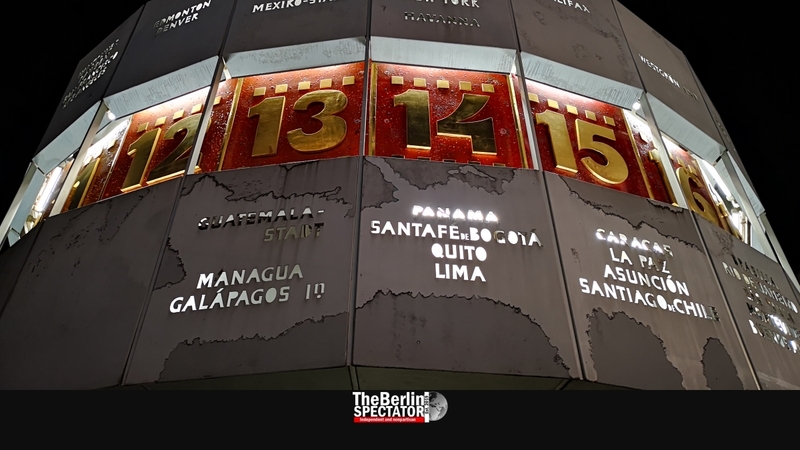 Especially at night, the World Clock looks interesting because the metal plates with the city names are illuminated. The Berlin World Clock is protected by law, as a site of historic interest. For its upcoming 50th anniversary, the marketing rights were liberalized. What this means is that little World Clock models might be offered at souvenir shops. Berlin’s television tower, located on the other side of Alexanderplatz train station, was inaugurated in 1969 as well, only four days after the World Clock. The slight difference in height, 250 versus 10 meters (820 versus 33 feet), is hardly noticeable. Similar to trees or icebergs, a significant part of the World Clock, which hardly anyone ever sees, is beneath the surface. Two meters (6.5 feet) under the ground, engineers can enter a rather large tech room. For instance it accommodates the electric motor which powers the ‘solar system’, and the transmission for the time zone ring. The latter is a modified transmission taken from a Trabant, one of those tiny cardboard vehicles the GDR regime called “cars”. Further up, the single pillar which holds the World Clock is hollow and contains a metal ladder used by technicians to check or repair the upper part of the clock’s mechanisms. Some of the latter were modernized after Germany’s reunification. Cities the GDR ‘forgot’, such as Tel Aviv, were added, others updated. Back then, 50 years ago, in the GDR, the designer Erich John won a competition for an object the regime wanted to build in the city center. The leadership in East Berlin commissioned him. Heike Schüler just released a book entitled ‘Weltzeituhr und Wartburg-Lenkrad‘ (‘World Clock and Wartburg Steering Wheel’, in German only) in which she tells the entire story. During her research, she found Erich John, a likable man who is 87 years old by now. Ahead of the anniversary, he was photographed in front of his World Clock. In 1968, he had drawn a first sketch of the construction he envisioned. The object turned out to look exactly like that sketch. 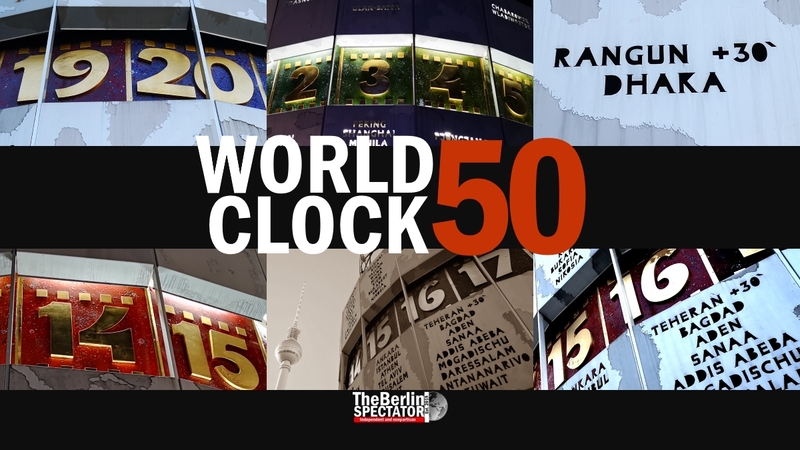 While checking old files, Heike Schüler found out that the Berlin World Clock has a predecessor. Underneath, there used to be some kind of a pillar set up in the 19th century, with regular clocks at the top and meteorology instruments fixed to it. The GDR regime picked up that idea, which Erich John modified. 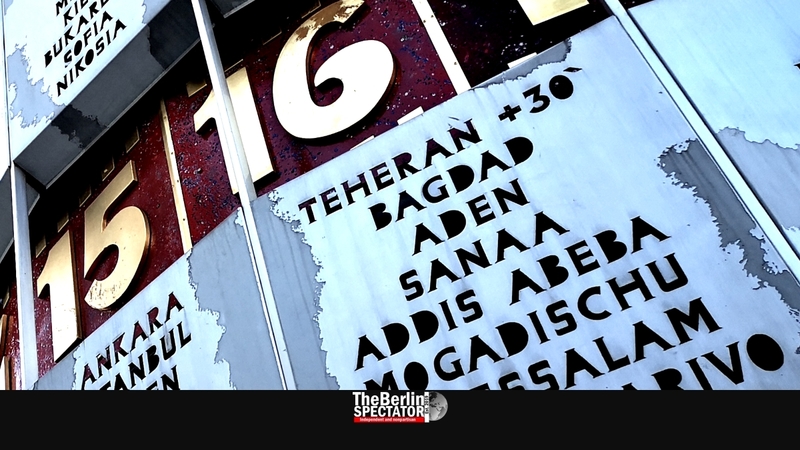 In East Berlin the World Clock was a popular meeting point, but the same applies today. “Shall we meet at Alexanderplatz?” “Yes, sure. World Clock, 5 p.m.” It can also be used as a giant, stationary umbrella. From the perspective of Berlin, it is the center of the universe. Of course the World Clock is indeed famous around the world. It was part of movies and video clips for stupid Pop songs. Happy birthday, World Clock.